Sea Glass Jewelry by Jane > Who Is Sea Glass Jewelry by Jane? My journey with sea glass began when I was a child lucky enough to spend summer vacations with my grandparents at a home my grandfather built in Wareham, Massachusetts. The house was perched high on a bluff overlooking Buzzards Bay and the Cape Cod Canal on a street my grandfather aptly named, Lookout Lane. For my sisters and I these were carefree times full of fun and exploration. My grandmother collected sea glass on her many beach walks and, of course, like all early sea glass collectors she displayed it in a big vase in her sunniest kitchen window. I loved to play with the sea glass, look at all the beautiful colors and discover my own pieces to add to her collection. The times I spent walking along the shore with my grandmother collecting sea glass, driftwood and shells are some of my fondest childhood memories and the beginning of my affinity for sea glass and the beach lifestyle. My husband, Mike, and I were already ardent beach combers and during our many island vacations we began collecting sea glass, amassing a rather large collection and, as a result, it seemed quite natural for me to start a sea glass related business. After much trial and error, lots of jewelry classes, and a long traverse along an even longer learning curve, I began selling my designs in early 2009, always amazed and a little thrilled when people actually purchased them! Since then I have exhibited at over 100 Juried Art Shows all over the country and now have a successful online sea glass jewelry boutique. After being in business for almost 10 years I can say that one of the most rewarding takeaways has been my good fortune to meet wonderful people who I never would have met if not for the sea glass connection. Some of them have become very close friends and I treasure them even more than I treasure my beautiful sea glass gems. Sea glass is an integral part of my life. I am fortunate to split my time (while not sea glass hunting!) between the fabulous Florida Keys and spectacularly beautiful, Newport County, Rhode Island. Both locales are friendly, scenic places to live and work and I only have to walk out the door to have plenty of stunning scenery to inspire me. I practically live in flop flops! Mike and I are still zealous sea glass collectors and our “vacations” inevitably revolve around sea glass hunting. Even during our trip to Ireland last summer we were looking for glass during brief stops in small fishing villages. 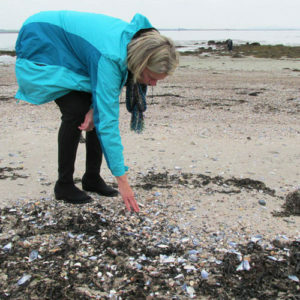 When we had a little extra time in Galway we finally found a beach where we were able to collect a bit and we’re looking forward to finding more this year in Northern Ireland where we hear there might be a secret “sea glass island,” in the town that Mike’s ancestors are from. We have a special collection of our best beach finds displayed in a glass top table that Mike made for me as a gift for one of our wedding anniversaries. Some of my favorite pieces in the display are a collection of sea glass hearts, bottle stoppers, marbles and glass buttons that we have personally found. We also have glass vases filled with small pieces of every sea glass color displayed in our living room windows and lots of sea glass decor! 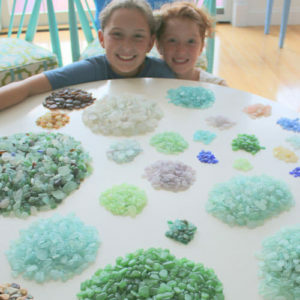 The grandchildren are already claiming their favorite sea glass collections. Our children and grandchildren have already “reserved” certain of our sea glass collections and we’re happy that they understand the beauty, story and value of sea glass and will cherish our labor of love as much as we do. Sea Glass Jewelry by Jane, has been a commercial member of the North American Sea Glass Association (NASGA) since 2010 and I earnestly support its mission of education and preservation. 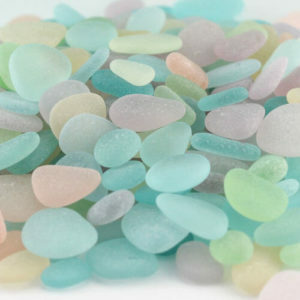 NASGA members agree that they will leave sea glass in its natural state and not create imitation sea glass; meaning that the sea glass will not be altered by, acid etching, sand blasting, tumbling, or by any other means so as to artificially replicate genuine sea glass. Members also agree to use genuine sea glass exclusively in their artwork or products. So when you purchase a sea glass jewelry design from Sea Glass Jewelry by Jane, you can have the peace of mind to know that it is authentic and has real value that will stand the test of time. 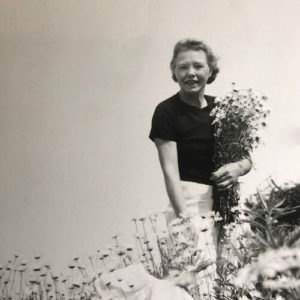 Jane and her grandmother, Emily, would walk many miles along the beach to the Cape Cod Canal, picking up sea glass along the way and saving it in jars placed on windowsills where the light would reflect its kaleidoscopic hues. 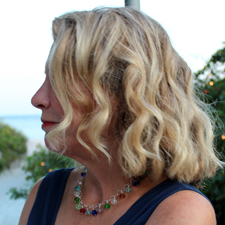 Jane, a Rhode Island resident for over 30 years, now spends winters in Islamorada, Florida Keys and summers and holidays in Rhode Island, not far from the place of her childhood memories near The Cape. She and her husband, Mike, love to travel and because of her husband’s love of boating and diving their vacations are always to exotic tropical paradises in the Caribbean, Bahamas, Mexico and Hawaii where they search the beaches for treasures like sea glass, driftwood, rocks and shells. In 2008 Jane left her publishing career of 25 years to follow her artist’s dream. Happily, the result of this lifestyle change is the successful enterprise, Sea Glass Jewelry by Jane. For many months, Jane studied jewelry making techniques, learned how to source quality supplies and crafted a qualified Business Plan with the help of the Center for Women and Enterprise in Providence, Rhode Island. This began a journey to turn what was once a passionate hobby into a thriving artisan business that she shares with her husband. Jane’s artistic process begins with the quest to find the core elements of the sea glass jewelry designs, the sea glass gems themselves. To find the best specimens she and her husband continue to travel to Puerto Rico, Bermuda, California, Hawaii and other destinations, spending countless hours on rocky shores looking for the most perfect pieces. The couple’s most recent travels have been in and around the Bahamas and they hope to search for sea glass in the Azores this summer! Jane and her husband, who has become an expert sea glass driller, have participated in scores of Juried Art Shows in the Florida Keys, Cape Cod and Rhode Island, California, Pennsylvania and beyond. They are members of the National Sea Glass Association and have exhibited at the organization’s national shows since 2010. In 2016 Jane’s enterprise, Sea Glass Jewelry by Jane, was awarded the Home Based Business of the Year Award by the SBA (Small Business Administration) Rhode Island district.